Y’all loved the Samoa Magic Bars so much last week that I decided to beat a dead horse. 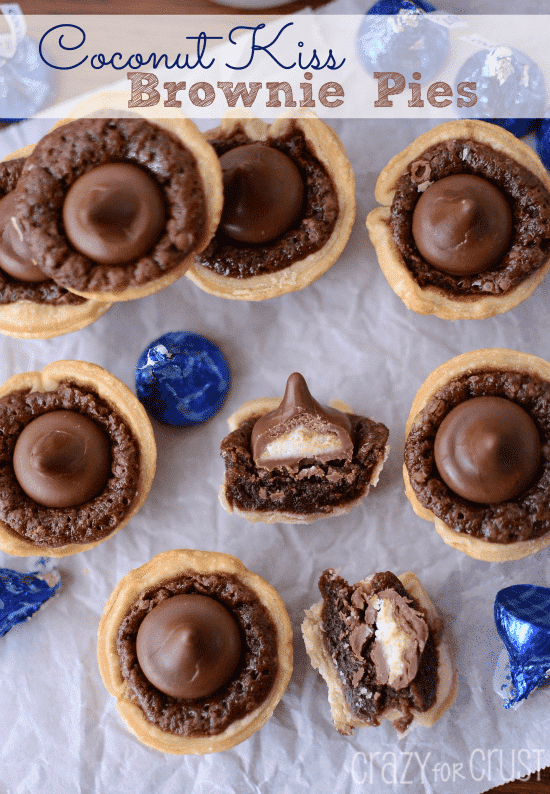 Enter: Mini Samoa Pies. 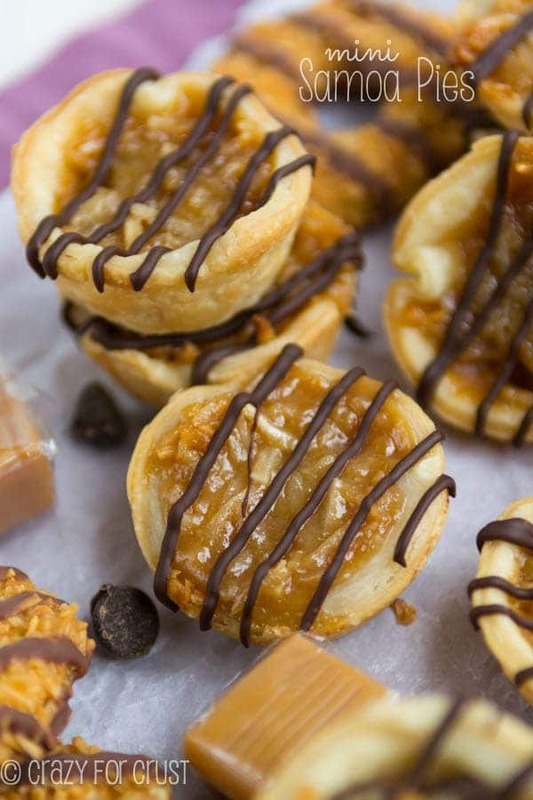 Again, no Samoas (or Caramel deLites) were harmed in the making of this recipe. My dessert ADD is at an all-time high right now. I cannot focus. I can’t stop switching gears halfway through recipes. I don’t have my March recipes all planned out. One thing that I love about my dessert distractedness? It gives me something to focus on. The other day at the gym I was doing wall sits, three rounds of a minute each. My trainer was getting mad because my poker face was in full effect (meaning I don’t grimace or show pain). I told him I go to my happy place during things I hate. My happy place is sugar. I’ve come up with some of my best recipes during wall sits, squat sequences, leg raise marathons, and the never ending curl sequence. Like these Samoa Pies. I came up with them one day during a particularly brutal weights-over-head lunge walk. Exercise = Dessert. My kind of equation! 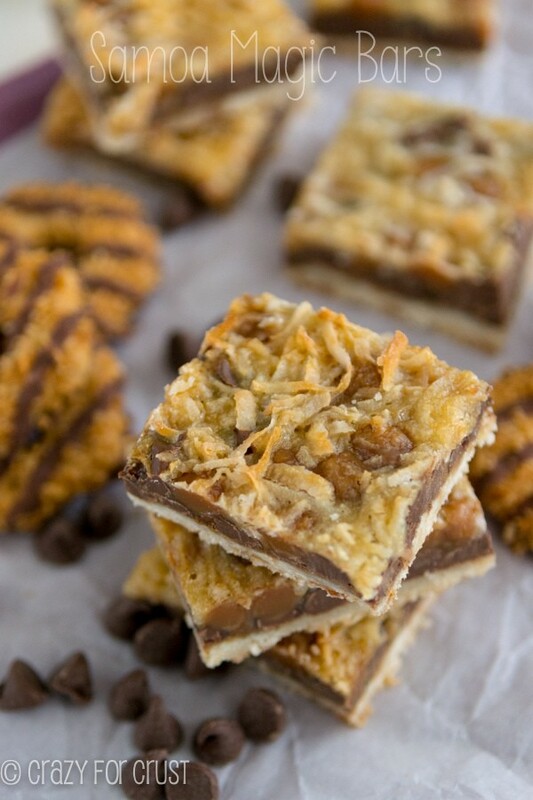 So I know I posted Thin Mint Truffle Brownies on Sunday, Thin Mint S’mores on Thursday, and Samoa Magic Bars last week. But, um, can we do one more? I mean, my BFF Ashton is doing 3 weeks of Girl Scout Cookies (it’s Samoa week!) so I figure y’all can hang with me for recipe #4, right? Good. These pies are worth it, I promise! Simply take a pie crust (I used a Pillsbury crust, but you can also use my all butter pie crust) and cut 2.5″ circles with a round cutter or jar lid or glass. Press each into a mini muffin pan. One crust makes about 18 mini pies, FYI. Fill each pie with chocolate chips, and then a mixture of melted caramel and coconut. 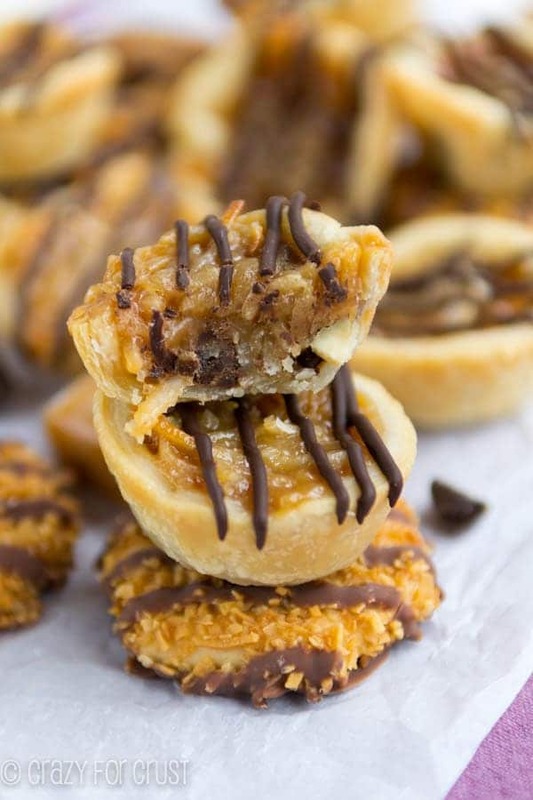 Bake until they’re browned and then top with a drizzle of melted chocolate to simulate the “Samoa Stripe”. These really do taste like a Samoa in pie form. 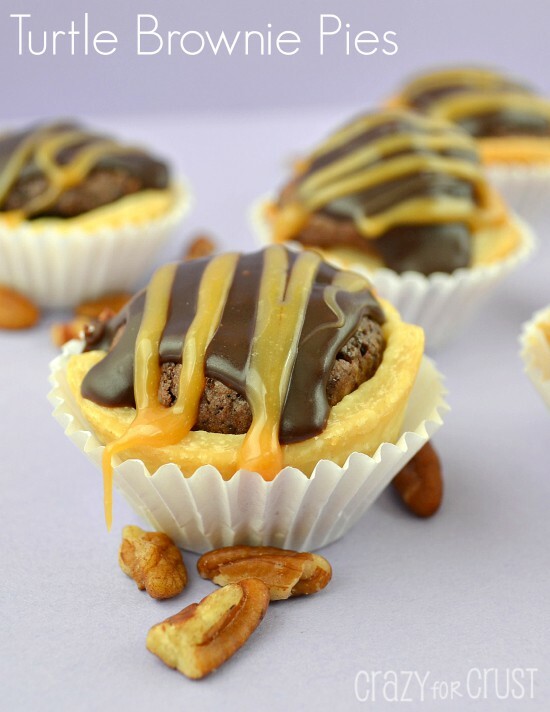 I make lots of mini pies, but I think these were one of my favorites! I ate a few too many so I had to do more wall sits. Place about 6 chocolate chips in the bottom of each pie (about 1/3 cup total). Place pans in the refrigerator until ready to continue. Melt caramel squares and water in a medium microwave safe bowl on HIGH power for 30 seconds; stir. Heat in additional 30 second increments, until it melts and is smooth after stirring (about 1 minute total). Stir in coconut. Spoon about 1/2 tablespoon of the coconut mixture onto the top of the chocolate chips. Spray your hands with cooking spray and press the coconut mixture down evenly (it is very sticky). Work fast, the caramel starts to harden after only a few minutes. Bake for 10-14 minutes, until the crusts start to get golden. Cool completely in pan then remove to a cookie sheet. They should pop right out, but if the caramel has melted onto the sides of the pan, you can use a knife to loosen them. Melt remaining chocolate chips in a small bowl with vegetable oil or Crisco. (30 seconds to 1 minute in the microwave.) Stir until smooth. Place in a sandwich bag and cut off a teeny tiny bit of one corner. Pipe stripes over the pies to mimic the stripes on the Samoa cookies. WOW! You know, Samoas are one of my favorite cookies! 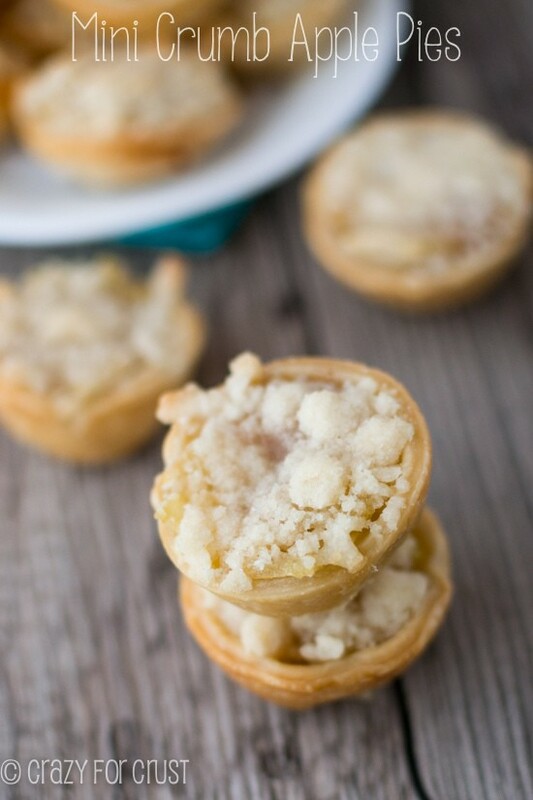 What a great idea to make them into a tart. So beautiful, too! These are right up my alley — mini and Saomas! YUM — I have got to try them! They sound so easy too, I may just have to double or even triple the recipe; just to make sure there is enough for my family to enjoy (on one night mind you!!!). I’m anxious to make the mini samoa pies but will be using double boiler for melting as I have not used a microwave since 2007—drs. orders! haven’t missed the micro one bit! These look great, I’ll try them for sure. They just bring up something I have wondered about for years- why are people so crazy about Girl Scout Cookies? They are really substandard factory cookies that have interesting flavors but always just fail to please. I feel un-American for saying so, but they really are no better than things like chips ahoy or anything else in the supermarket. If they didn’t come with cute little neighbor/realtive/big-eyed-little-girl-atmy-door guilt and this weird “get them now” desperation would sane people with taste-buds really but them? I bet it’s because, back in the day, you could ONLY get them once a year. Now that’s still true, but Keebler has knock offs that are 50% cheaper. I only buy them now to support my daughter’s friends, then I freeze the box for summer vacation. Oh my goodness! These look so good! My only question would be how long do they last? I’m thinking of making them 4 days in advanced for a party, is that too long? I think they’d last, in an airtight container, for about 3-4 days. You can also freeze them! I don’t have a mini muffin sheet but have all of the ingredients! Can I make them as normal sized muffin pies?